Select the data source here. Opens a dialog where a filter can be defined. This setting can only be selected if you have chosen a subordinate data group as the data source. This setting will only display the data records that are in a parent-child relationship with the currently selected data record. In this column, the titles of the data fields, which are integrated as table columns, are listed. Here, the data type of the data fields, which are integrated as table columns, are listed. Opens a menu with the following options. This menu item allows any number of buttons to be added to each table row. Each button is displayed in its own table column. Select this menu item to open the dialog to select data fields, just like when the "Columns" area is double-clicked on. This menu item allows calculations to be performed in an area underneath the view table, such as to show the total amount in a column. This menu item adds a column where static text can be entered. Deletes the selected table column from the list. Opens the properties dialog for the corresponding table column. Opens a dialog for creating a new calculation. Calculations can be performed in an area underneath the view table, such as to show the total amount in a column. With the arrow buttons, the order of the columns can be changed as desired. The higher a field is positioned in the list, the further left the column will be shown in the table. If a table column is selected, you can select from the possible control types here. You can define the target destination for buttons. 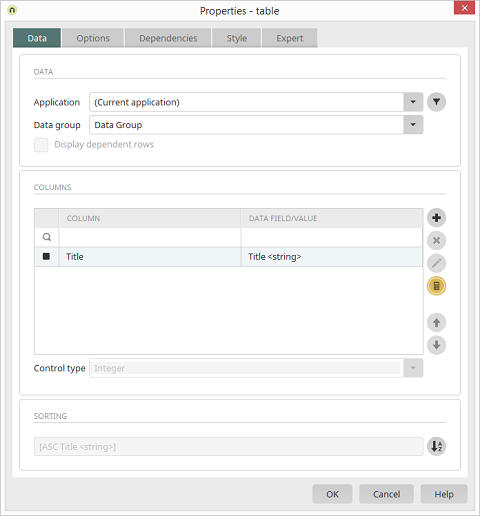 The control type Dynamic view can be selected for data fields with the type string, text, integer, double, datetime or boolean (meaning for all data types except for file), when the data field originates from the main data group that provides the data for the view table. The control type Multiple selection must be select for data fields with the type string, text, integer, double, datetime or boolean (meaning for all data types except for file), when the data field originates from a child data group of the main data group that provides the data for the view table. The control type "Multiple selection" can be selected for child data groups with the type "file" but is not necessary. Opens a dialog where the table sorting can be defined. Preselections are used to group data. A preselection can be created from the context menu of the view table or via the Edit menu / Preselection / Create preselection when the table is selected on the workspace. You can use the tabs in the footer of the table to switch between Table and Preselection 1. In the properties dialog, a field can be selected which will be used to group the data records in the table. In the database, a "Distinct" query will be defined to filter the data records. You can define as many preselections as you would like for a table. The order of the preselections can be adjusted via the Edit menu / Preselection / Move left or Move right respectively. Preselections cannot be created for view tables that are connected to OData data groups. The SQL keyword "distinct" cannot be used by OData. In this case, selecting data records must be solved by using filters or dependencies.